Tanker problems are holding up the long-awaited transatlantic deployment of British and U.S. Marine Corps F-35Bs in time for their debut at two major U.K. air shows. C'est le grand jour, la répétition générale du défilé aérien du 14 juillet. Alphajet, Mirage 2000 ou encore Rafale. Après des semaines de préparation en solitaire, ils sont des dizaines de pilotes de l'armée de l'air à avoir fait le déplacement sur la base aérienne de Châteaudun. Bertrand Brown a publié:"Le 12 juin dernier, nous avions fait état d'une rumeur qui agitait depuis quelques temps le monde de l'aviation ancienne, suggérant que Christopher Nolan envisageait de détruire un warbird pour le tournage de son film "Dunkirk". D'après France 3 Nord-Pas"
Le 12 juin dernier, nous avions fait état d'une rumeur qui agitait depuis quelques temps le monde de l'aviation ancienne, suggérant que Christopher Nolan envisageait de détruire un warbird pour le tournage de son film "Dunkirk". D'après France 3 Nord-Pas-de-Calais, la rumeur est infondée car il ne s'agirait pas d'un warbird mais d'une réplique de Spitfire spécialement construite pour l'occasion. 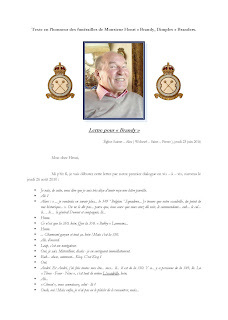 Merci à Patrick qui a déniché cette information. Huw Hopkins posted: "On the 70th anniversary of the first flight of the DHC Chipmunk Old Warden airfield in Bedfordshire played host to a fly-in to mark the occasion. Huw Hopkins was there for GAR. 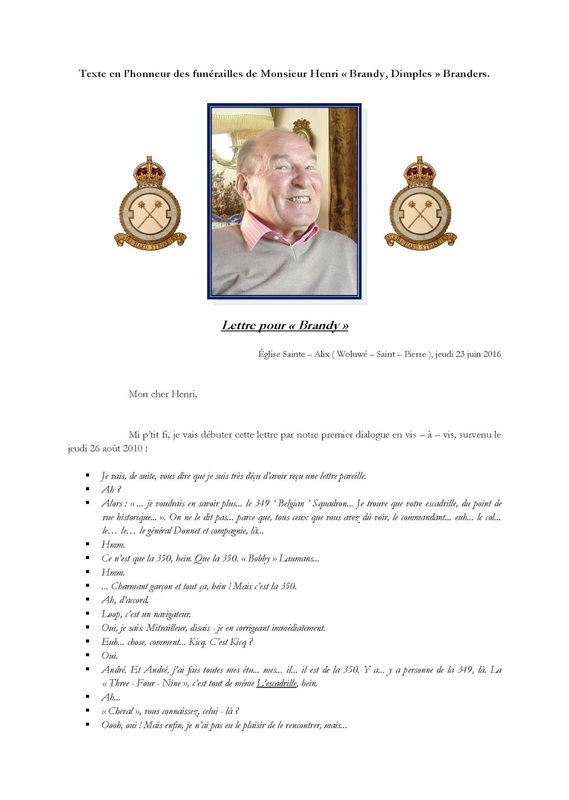 The inaugural flight of the type took place at Downsview, Toronto in Canada wi"
Voici le texte en l'honneur d'Henri, notre regretté et formidable ami. CEO Arnaud Feist of Brussels Airport Company has received the exceptional and one-off 'Leader of the Year' Award at the ACI Europe congress in Athens for his approach and leadership after the attacks at Brussels Airport on 22 March. Brussels Airport won the 2015 'Best European Airport' award in the 10 to 25 million passenger category. Last year Brussels Airport already was the runner-up best European airport in the same category. The ACI Europe Best Airport Awards assess airports on their excellence and achievements across a range of disciplines including customer service, retail and environment. 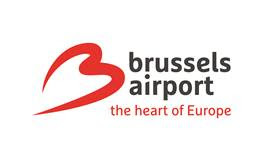 Brussels Airport won the award of best airport 2015 in the 10 to 25 million passengers-category on the basis of its key investment in the Connector including the world's first remote screening of cabin baggage on a large scale, which has improved the passenger experience (e.g. reduced walking distances, more clarity on the way to take, reduced waiting times). The airport was also praised for its successful network developments and its improvements in public transport and parking facilities. "This award is very important to us as it recognises the efforts and the energy we have invested since several years in our airport product, in services to our clients, the airlines and passengers, and in the further development of our European and intercontinental network. I'd like to thank all the teams that have made this possible", says Arnaud Feist, CEO of Brussels Airport Company. ACI Europe created a special Leader of the Year Award category this year. The recipient of the award was Arnaud Feist, CEO of Brussels Airport Company, for his extraordinary leadership and courage together with his remarkable decisiveness and wisdom in managing the aftermath of the terrorist attack at Brussels Airport on 22 March. This Award was presented by Augustin de Romanet, President of ACI Europe and President & CEO Groupe ADP. Feist dedicated the award to the 20,000 airport employees. "I thank ACI Europe for this award. It is very precious to me as it is awarded by my peers in the airport industry. My first thoughts go out to the victims of the cowardly attacks, and especially to those who are still in the hospital three months after the attacks. Life goes on, life must go on but we will never forget them. They have a place in our heart forever. I would like to share this award with all teams of Brussels Airport who have worked day and night to first rescue the victims and then to restart airport operations in a safe and secure manner", thus Arnaud Feist, CEO of Brussels Airport Company. ACI Europe is the European airport association and serves the interests of the European airport industry. The organisation represents 500 airports in 45 European countries, together accounting for 1.8 billion travellers, 90% of all commercial air traffic in Europe, 18.4 billion tonnes of freight and 21.2 million flight movements. Please find links to our press release in English, French and Dutch. Lunak : Video: "20160623 Fouga Magister MT-5 airworthy"
Thanks Jef and congratulations to the Antwerp team for the achievement. MT-5 took off for the Belgian Air Force Days @ Florennes this WE. After 9 years the Whistling Turtle is back in the sky, thanks very much towards the people that made this all possible ! Respect and memories that come back - thank you ! Video: "Low Level Mosquito FB.26 fly-bys"
Video: "10 years Tailwheel Meet"